Of course, with Chardonnay being so popular these days, I just had to do a page on it. Not to mention the fact that it’s my most favorite California Wine! It has been a staple of California’s wine production since the very first days when producers began naming wines after their dominant grape variety. It is the most popular and the single best-selling type of wine California has to offer including white, red or pink. Hey! It's the wine that California made famous. Martin Ray, Fred McCrea and James Zellerbach are three Californians who stand out as true pioneers for producing this as a varietal wine. However, Robert Mondavi is the one who truly brought fame to this wine. He opened his winery in 1966 and starting producing premium varietal wines, such as Cabernet Sauvignon and Chardonnay, and then later, Pinot Noir, Merlot and Sauvignon Blanc. The wine sold well, received fine reviews and they were good. So then, other wine producers decided to jump on the varietal bandwagon in California. In the late 1980s and the 1990s, this wine had reached its popularity! It went through some various stylistic changes to the style it is today. Are you bored yet? There is so much more to write about, but I just wanted to give you “the jist” of this delicious California wine! Where Does Chardonnay Grow in California? 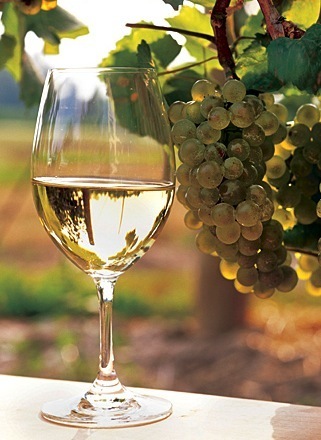 The grape is a white grape that makes white table wines and sparkling wines. It can grow productively in all kinds of climates but wine producers have found that it grows best in cool coastal regions such as the Sonoma Coast, Russian River Valley and Carneros. Because the grape is easy to grow in a wide range of climates and types of soil, it grows throughout California’s wine regions. The fact that this wine is the number one best-selling varietal wine from California is no small incentive to grape growers to continue growing this grape wherever they can. These wines usually have some smoky, toasty aromas and flavors that come from oak. They also have fruit aromas and flavors that include citrus fruit, tropical fruits like pineapple and mango, vanilla, butterscotch and a lot of them have flavors of apple. I think the big reason why this is my favorite wine is because they are not over-powering and strong and they are not as sweet as say a Pinot Grigio or Sauvignon Blanc. Somewhat just in the middle, easy drinking and they go so well with many foods. You can spend anywhere from $2.00 to $100.00 or more a bottle! In my experience, it seems to me like the cheaper Chardonnays are much more sweet or “tinny” tasting where as the more expensive ones have a sense of real concentration of flavor, more buttery and oakey. Mid-priced wines, especially those that cost about $15.00 to $20.00 a bottle, seem a bit less overtly sweet. But at the same time, they are not too oakey. They seem very balanced. This is usually a first choice for me.